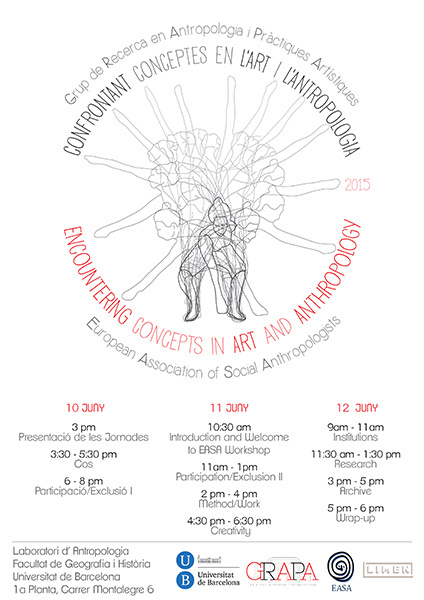 The workshop Encountering Concepts in Art and Anthropology was the first organised by the GRAPA research group in collaboration with the Anthropology of Art Interest group of VANEASA (Visual Anthropology section of the European Association of Social Anthropologists). 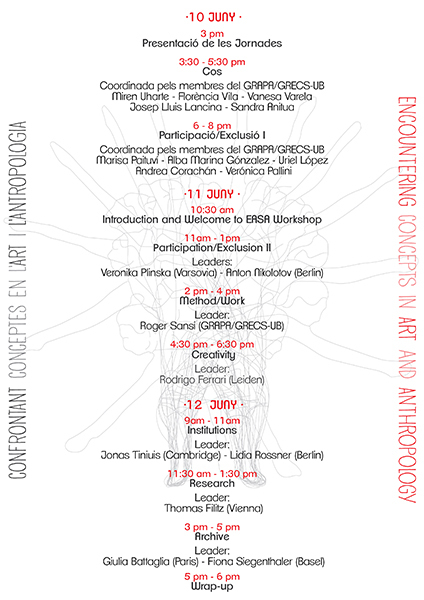 The main objective of the workshop was to discuss the relation between contemporary art practice and anthropology. After decades of experimental practices of exchange between art and anthropology, we think it si time to acknowlegde the misunderstandings that sometimes have been generated around this exchange. From GRAPA we thought it was a good time to duscuss, from the point of view of Anthropology, which are the concepts we work with in these experimental processes and ask if perhaps artists and anthropologists are using the same concepts in diferent ways. The objective of the workshop was to discuss some of these concepts, precisely in their ambiguity: Body, Participation/Exclusion, Method, Creativity, Institutions, Research, Archives. Our aim was not to produce definitions, but to discuss about the problems generated by these concepts. The worshop took place on the 10, 11 and 12 of June of 2015 in the Laboratory of Social Anthropology of the University of Barcelona.